I am proud to announce that we now have over 60,000 members of the global info-elite who receive the weekly World Security Network Newsletter. These include 32,000 journalists; 20,000 business executives; members of the Young Presidents Organization; alumni from leading universities such as Harvard and INSEAD; 5,000 foreign policy and defense experts and academics; and over 3,000 members and staff of Parliaments including the European Parliament, the German Bundestag, the U.S. Senate and House of Representatives. Sixty percent of our readers live in the U.S., thirty percent are in Europe and ten percent in the rest of the world. Please share with your friends this news and the current issue of the non-profit WSN Newsletter and invite them to become members, at no cost, of the growing Network of informed and thinking global citizens "Networking a Safer World". As you will see in this Newsletter, including the exclusive interview with Dr. Friedbert Pflüger, we offer timely and insightful analysis on foreign policy and security issues from influential and original thinkers. Dr. Friedbert Pflüger is one of the leading Christian Democrats (CDU/CSU) in Germany after the older generation of Helmut Kohl and their most erudite and influential foreign affairs spokesman in the German Bundestag. When I asked him recently to share his and his party’s views on world affairs with the readers of the World Security Network, I was impressed by his perceptive and pragmatic approach to what for many might seem intractable international problems. It was clear that Dr. Pflüger and his colleagues at the CDU/CSU had a vision for dealing with the strategic security challenges of our day that was well thought-out. From his assertion that Europe cannot construct itself in opposition to the U.S. to his insistence that Europe and Germany must increase their military capabilities, Dr. Pflüger challenges those who think that the Transatlantic Alliance cannot be transformed to serve the new security realities of the 21st century. He is equally keen on the need for the U.S. to be open to multilateral solutions and on the necessity for the international community to engage the young generations in the Islamic countries in a culturally sensitive dialogue. Dr. Pflüger’s views are important in yet another away. He is the most influential foreign affairs advisor to the CDU Chairwoman Angelika Merkel and with the declining public support for the ruling Social Democrat/Green Party coalition in Germany, the concepts that he shares with the readers of the World Security Network could become tenants of a new foreign policy pursued by Germany and shaping EU’s security doctrine. 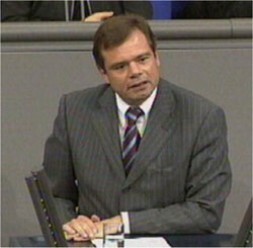 Dr. Friedbert Pflüger was born in Hannover (Lower Saxony) in 1955. He became Chairman of the Association of Christian Democrat Students (RCDS) and received his PhD in Political Science from the University of Bonn in 1982 about " U.S. Human Rights Policy", studying under the renowned Prof. Karl Dietrich Bracher. He joined the staff of the then Governing Mayor of Berlin, Richard von Weizsäcker, and was Spokesman of the Federal President of Germany from 1984 to 1989. 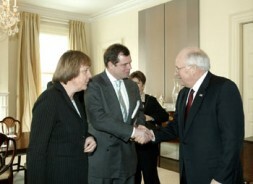 In 1990 he was elected to the Bundestag and served as the CDU/CSU Disarmament Policy Spokesman (1994/98), Chairman of the Bundestag Committee on the Affairs of the European Union (1998-2000), elected Spokesman for Foreign Policy in October 2000. He is Deputy-Chairman of the CDU in Lower Saxony and a Member of the Federal Executive Committee of the CDU (Bundesvorstand) in Berlin. Dr. Pflüger is also a Member of the Board of Trustees of the International Crisis Group. 1) Dr. Pflüger, what can be done, in your opinion, to improve the transatlantic relations? The United States should not play a role in splitting Europe, just as Europe cannot construct itself in opposition to the U.S., or see its role as the containment of American hegemony. Both currents contradict historical lessons and the positive experiences of the Transatlantic Alliance. This also implies that the United States must deal better with France, and that the political troika of Paris-Berlin-Moscow must end. The mutual renunciation of recent antagonizing practices by both sides is important to overcome current tensions. The United States must be open-minded to multilateralism, just as Europe must increasingly comprehend and live up to its global responsibility. For the U.S., this means realizing that the Alliance is in itself a strong value; for Europe it means taking the concerns and fears of partners seriously. The U.S. should also gauge Europe based on its new European Security Strategy. The special value of the Alliance will manifest itself when the partners address again foreign policy challenges cooperatively. The recent transatlantic-advocated initiative of three European foreign ministers with regard to the Iranian nuclear program is an excellent example of such cooperation to the benefit of all transatlantic partners. Dr. Pflüger in the Bundestag:"Global responsibilities for Europe"
2) What can be done to enhance the defense capabilities of the European countries in NATO? Europe has recognized that it needs to significantly increase its military capabilities. Deficits have been identified in the areas of, among others, strategic lift capabilities, reconnaissance, and communication. Concepts and ideas aimed at increasing European capabilities are present: an intervention force is planned, a treaty establishing a basis for pan-European armament is signed. Now we are waiting for action. And this is where Europe, and especially the current red-green German government, stalls. As a first step, Germany has to make additional funding available to support the already under-equipped German armed forces. Further steps involve stronger European defense coordination at the EU level, where national competencies and capabilities have to be pooled to avoid needless duplication. For example, not every European nation, especially land-locked countries, needs a navy. 3) How can the issue of ‘Education for Hate’ for children in Palestine and other Islamic states be addressed? A broad strategy among transatlantic partners towards the greater Middle East must be synthesized not just around hard security questions, but also around the soft aspects of trade, economic opportunity, and cultural issues. The latter comprises the education of tolerance and respect of opinions, and not just in Muslim countries. Therefore, we must seize every opportunity to urge change away from the ‘education of hate’ by means of diplomatic pressure and incentives. 4) What can be done to improve the dialogue between the West and tolerant Islam? A dialogue can only be successful when first the West becomes conscious of its own values and presents them convincingly. Consequently, this means an end to the West’s justifying its aims through relativizing its values or portraying an absence of values or interests when convenient. These tendencies justifiably repulse especially Muslim believers who see these inconsistencies as symbols of decadence in the West. Secondly, we need to distance ourselves from double standards in our own policy towards the greater Middle East. The different ways of dealing with different autocratic regimes in the region lessens our credibility. Thirdly, we need to expand our dialogue with all segments of the Islamic society, including more extreme Islamic groups, in order to counteract misperceptions and the tendency to generalize an enemy image of the West. The fact that 50% of the population in the Islamic world is under 20 years of age makes an expanded dialogue with a successor generation absolutely necessary. This dialogue should not hesitate to embrace even unfamiliar topics such as the idea of ‘Islamic banking’ – the interest-free credit system which respects the religious ban on proceeds from interest. 5) How can the international community promote democracy in Cuba? The harsh – and so far ineffective - American sanction-regime has to be downgraded and harmonized with the goals of European sanctions, in order to remove Castro’s greatest instrument of propaganda as well as grant the people of Cuba access to a globalized world. This access would add fervor to the already existing movement for change in Cuban society. Solidarity between Castro and other Latin American leaders should be severed. Contact with Cuban dissidents must be increasingly fostered and expanded. 6) What can be done to neutralize the nuclear danger from North Korea? In this difficult and very dangerous conflict, the American government is undertaking the only practical strategic path: on the one side to go to North Korea and offer a regional security guarantee, and on the other side not to reward North Korea’s break with the framework agreements and the non-proliferation treaty. Negotiations should take the form of a total package addressing a wide range of concerns, similar to the process of the Conference of Security and Cooperation in Europe. Any future agreement must have an enforcement mechanism triggering all parties. CRY FOR ME- I WAS DAMASCUS!